Fall Festivals Highlight Scenery, Agriculture, Culture and More in Orange County, N.Y. Discover everything Orange County has to offer during the Hudson Valley’s most colorful time of the year. Orange County, N.Y. (August 1, 2018)- Thanks to its spectacular scenery, acclaimed restaurants, hotels, famous historic sites, and delicious farm fare, Orange County has become one of New York’s premiere destinations. Travel just an hour north of New York City to experience Orange County’s landscapes dressed in their vibrant autumnal best as you celebrate unique festivals and special events in quaint villages, vineyards and other spectacular settings. General Montgomery Day, Clinton and Union Streets, Montgomery, Saturday, September 8, 2018, 9:00 a.m. – 10:00 p.m. This quaint village, celebrating its namesake, hosts a day chock full of events including an 8K race, parade, soap box derby, live entertainment, tons of vendors, food and more. Stay to enjoy an evening of fireworks! For more information, visit www.villageofmontgomery.org. New York Air Show, New York Stewart International Airport, New Windsor, Saturday, September 15, 2018 – Sunday, September 16, 2018: The U.S. Air Force Thunderbirds jet demonstration squadron headlines a full complement of performers at the 2018 New York Air Show. Gates and ground displays are open 9:00 a.m. – 5:00 p.m. each day. Flight performances take place 12:00 pm – 4:00 p.m. Purchase tickets online or by phone. Parking fee. 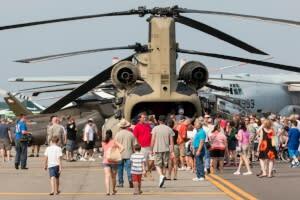 For tickets and information, visit http://airshowny.com. Palaia Winery Fall Festival, 10 Sweet Clover Road, Highland Mills, Saturday, September 22, 2018, 2:00 – 6:00 p.m.: Celebrate the fall harvest at a scenic vineyard to the sounds of “The Peach Project,” an Allman Brothers Tribute Band. Family-friendly activities include pumpkin picking, wagon rides, pumpkin painting, pumpkin bowling and bounce slides. Hot cider, mulled wine, beer, food and more will be available. For more information, visit www.palaiavineyards.com. Cornwall Fall Festival, Main Street, Cornwall, Sunday, September 23, 2018, 10:00 a.m. – 5:00 p.m.: Enjoy a day of live entertainment, delicious food, vendors, raffles and more along Cornwall’s historic Main Street, lined with gift shops, taverns and restaurants. Kid-friendly activities include inflatables, a hay maze, petting zoo, pony rides and tie-dye t-shirt demonstrations. For more information, visit www.cornwallchamber.org. Warwick Applefest, South Street, Warwick, Sunday, October 14, 2018, 9:00 a.m. – 5:00 p.m.: Celebrate the harvest in Warwick! 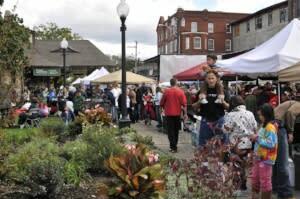 This day-long event of family fun fills the streets of the historic village of Warwick with hundreds of craft and food vendors, numerous musical acts and entertainment, a farmers’ market, carnival rides and an apple pie baking contest with slices for sale. For more information, visit www.warwickapplefest.com. Enhance your visit with a stay at a cozy B&B or book a hotel convenient to your itinerary. Be sure to check out Orange County Tourism’s full online events calendar and Facebook page: Orange County Tourism NY to keep up on all of the memorable experiences available to visitors. Orange County Tourism, based in Goshen, N.Y., is the county’s tourism headquarters and a participant in the I LOVE NY program. A comprehensive listing of area attractions, lodging, and events can be found at www.OrangeTourism.org. For a free copy of the Orange County Travel Guide, email tourism@orangecountygov.com or call 845-615-3860.